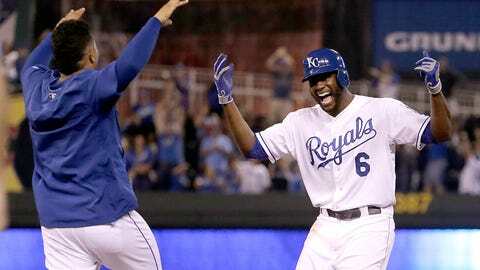 Lorenzo Cain and the Royals begin a best-of-five AL Division Series on Thursday night. KANSAS CITY, Mo. — When the Houston Astros had recorded the final out in Yankee Stadium on Tuesday night, they flooded onto the field in a wild celebration, all their years of losing finally a memory. It looked a whole lot like the scene in Kansas City a year ago. Now, the long-suffering Astros will try to accomplish what the once-beleaguered Royals did by building on their wild-card victory over the Yankees. They visit Kansas City to begin a best-of-five AL Division Series against the Royals on Thursday night at Kauffman Stadium. "It kind of reminds us of us last year," Royals third baseman Mike Moustakas said after a light workout Wednesday afternoon, "young and hungry and out there trying to prove to everybody that we deserve to be here." The Royals certainly accomplished that 12 months ago. After ending a 29-year postseason drought, the plucky bunch of youngsters swept all the way to the World Series, where they fell in seven games to the San Francisco Giants. But it was the Royals’ dramatic, extra-inning victory over the Oakland Athletics in their AL wild-card game that instilled in them a belief that they could play with anybody in baseball. Much like Tuesday night in the Bronx seemed to galvanize the young Astros. They clowned around before the first pitch, then took care of New York when it was time to get serious, before resuming their playful antics with a rousing 30-minute postgame party. "You know, we did it in a little more dramatic fashion than they did," Royals manager Ned Yost said of the wild-card win, "but they played a very solid game, took advantage of mistakes, excellent pitching and defense. Both teams play with a lot of passion and energy." In other words, both teams have a whole lot of fun. "I don’t know if anybody else picked up on that, just as a fan watching what they were doing last year," said the Astros’ Collin McHugh, who will start Game 1. "You can tell they have a fun clubhouse. I think that’s probably the closest similarity I can see with our team." There are others, though. Both endured long periods of ineptitude, underscored by 100-loss seasons. Both were painstakingly built through the draft. Both clubs put a premium on speed and defense. And both have formidable bullpens and stout rotations, with the Royals sending out hard-throwing Yordano Ventura to face McHugh in the series opener. The similarities are hardly lost on Astros manager A.J. Hinch, who played for the Royals in the early 2000s, when the organization was in the depths of despair. "I think both teams sense the opportunity might be there to make a run in October," Hinch said. "Certainly, they’ve been a year or two ahead of us in this, I guess, move to the middle of relevant baseball with their run last year. But both really good clubs." Really young clubs, too. The average age of Houston for its wild-card game was 28 years, 343 days. The Royals were an average of 29 years, 51 days on Game 1 of last year’s World Series. "They’re a young, energetic team, as we are too," said Royals outfielder Alex Rios, who is in the postseason for the first time after 1,691 games. "But they’re also a team that has a lot of talent, so we have to go out there and play the same game we’ve been playing all season." The Astros and Royals are not mirror images of each other. 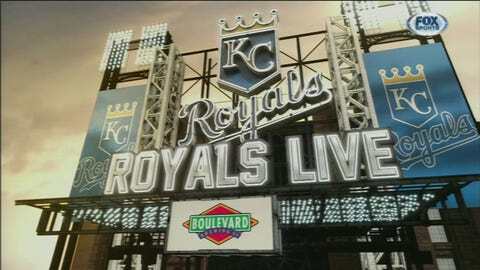 Houston pounds home runs at the expense of strikeouts, while the Royals play to contact and grind out runs. The Astros greedily accepts walks while Kansas City swings away, regardless of the count. Then there is the difference in their ballparks. Kauffman Stadium is cavernous, the kind of place where home runs anywhere else turn into routine fly balls. Minute Maid Park is a bandbox where pop flies often carry the wall. Oh, and there’s one more difference: The Royals played in the World Series a year ago. It may not be much of an edge in postseason experience, but it’s at least something. "We had a good run last year, but that was last year," Moustakas said. "This is a new season now, the best team is going to win. We have to find a way to beat that club."